Brad Croft is a shareholder, a member of the firm's Executive Committee, and Chair of the Litigation Department. He concentrates his practice on complex business matters in the areas of construction, real estate, partnership disputes, and general commercial law. In his 22 years as a trial attorney, Brad has represented clients in a wide variety of matters, including construction claims, general commercial disputes, employment matters, claims against schools and universities, securities and financial services disputes, condominium cases, and tort claims. He has tried cases before judges, juries and arbitration panels in Massachusetts and Connecticut. Brad is a recognized leader among Massachusetts litigation and construction lawyers. He was selected as the 2015 Massachusetts Construction Lawyer of the Year by Best Lawyers in America, the only lawyer in Massachusetts to receive this honor. 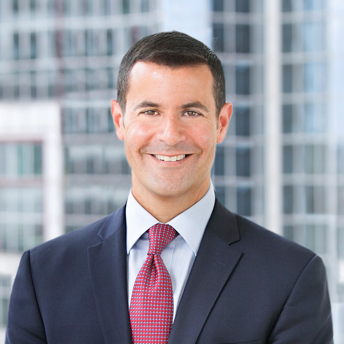 Brad recently served as co-chair of the Litigation Section of the Boston Bar Association, which has over 2,500 members. He is also the past chair of the BBA Construction Law Committee and Steering Committees for both the litigation and real estate sections. He is on the Board of Directors of the Massachusetts Building Congress, the oldest construction industry trade organization in the area. In his construction practice, Brad represents general contractors, owners, subcontractors and suppliers, as well as developers and sureties, in all aspects of construction transactions and disputes. Brad counsels his construction clients on risk avoidance and ways to minimize their exposure to liability and legal fees. His clients rely on his experience and expertise to draft and negotiate all types of contracts relating to construction projects and to resolve construction and real estate disputes through negotiation, mediation, arbitration and litigation in state and federal courts. Brad also regularly represents students in private and public university disciplinary cases arising from allegations of plagiarism, assault, harassment, inappropriate sexual conduct, and underage drinking, among others. He helps students and parents navigate the often complex administrative hearing and investigation processes, advises them on their state and federal rights under Title IX, FERPA and the Clery Act, and helps with preparation of written statements, interviews, hearings, and appeals.